Author: Steve Pillinger, Letiwa Galboran. Series edited by: Hans-Jürgen Sasse †. 4 pp. Roman, 416 pp. Rendille is a Lowland East Cushitic language, spoken in northern Kenya by about 40,000 people. Its closest linguistic relatives are Somali and Boni. The present book starts with a grammatical outline of Rendille in which the most prominent features of Rendille morphology and syntax are presented to provide the user with an overview of the language structure. The morphological features are summarized in several tables at the end of this introductory part. 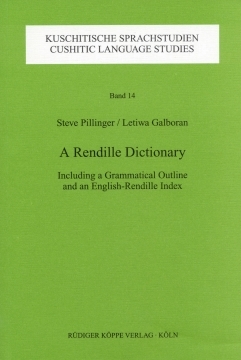 The main part of the Rendille Dictionary comprises more than 5,500 entries which are presented in alphabetical order. Thus, the dictionary not only contains the basic, everyday Rendille vocabulary, but also includes specialised idioms ranging from animal husbandry to traditional religion, village health care and children’s fables. Furthermore, the use of the Rendille words is illustrated with frequent sample sentences and drawings. Cross-references to other entries are included to allow the user to trace the complex semantic relations within the lexicon. The orthography used was developed in close contact with the Rendille community and finalised in 1987, and is given with both the IPA and Somali equivalents. A detailed English-Rendille index completes the dictionary part. This index is listed alphabetically according to the English entries and includes the respective Rendille equivalents with the most important grammatical information. For obtaining more information, e.g. concerning the use of the Rendille item the dictionary user may refer to the Rendille dictionary part. The Rendille Dictionary is meant to provide for the needs of Rendille speakers, non-Rendille speakers working in the Rendille area and the wider academic community alike. A great step forward in East Cushitic lexicography is represented by the recent dictionary of S. Pillinger and L. Galboran [...]. Es wäre zu wünschen, wenn die meisterhafte Durchdringung des Stoffes, die sich in diesem Werk zeigt, auch bald in einer ausführlichen Grammatik dieser so archaisch anmutenden kuschitischen Sprache ihren Niederschlag finden würde.